A recently published list of foods banned in countries outside the U.S. has riled the plates of many in the food industry. Last week, Buzzfeed published a list of 8 ingredients banned outside the U.S. that are found in foods in America. The list was derived from the book, Rich Food, Poor Food: The Ultimate Grocery Purchasing System, written by husband and wife team Jayson Calton, who has a Ph.D. in nutrition, and Mira Calton, a licensed certified nutritionist. Said Mira Calton: "We call it our GPS of grocery purchasing system: how to identify dangerous ingredients -- so people can shop safe and smart in the grocery store." The book includes a list of banned foods and dangerous foods, which they call "poor food." Calton said manufacturers are not putting these ingredients in their food to be "bad people." "It might have been part of their original formula and sometimes they don't know," Calton said. The Food and Drug Administration assures the public that despite the frenzy over the list of ingredients banned in some countries outside the U.S., it is doing its job of monitoring food safety. "As part of FDA's overall commitment to ensure the safety of the food supply, the agency uses an extensive, science-based process to evaluate the safety of food additives," the agency said in a statement to ABC News. "The law requires that the FDA determine there is reasonable certainty that an additive does not cause harm when it is used as intended. The agency continues to monitor the science on food additives and is prepared to take appropriate action if there are safety concerns. When determining that a food or ingredient is 'generally recognized as safe' or GRAS for its intended use in food, the same quantity and quality of evidence is required as is needed to approve a food additive." Derek Lowe, a chemist who has a Ph.D. from Duke University, said the list is an example of "chemophobia." He told ABC News his reaction to the viral online list was "incredulity and revulsion." "The thing is, I'm not reflexively saying people should eat all the food additives they can find. I don't myself. But the amount of understanding in the article was so minimal, it really pushed my buttons as a scientist," Lowe said. The Caltons said they are not calling on the FDA to ban these ingredients, but they said "all of the ingredients on the list pose a potential danger to consumers and we feel the consumer should be made aware so that they can make an informed decision as to whether or not they want to buy a product with these ingredients." Julie Jones, a professor emeritus with St. Catherine University in Minnesota and author of the textbook, Food Safety, said what drives one country to ban a food and not another often has to do with as much politics as it does science. If one believes Paracelsus's principle, "the dose makes the poison," Jones said she believes these products have gone through the correct due diligence in the U.S.
"We have science and politics and they are different in each country," Jones said. Banned in Norway, Finland and France, Blue #1 and Blue #2 can be found in candy, cereal, drinks and pet food in the U.S., the Caltons say. 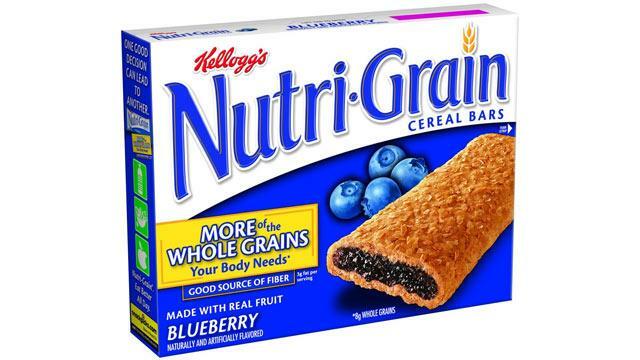 Kellogg's did not reply to multiple requests for comment about its use of Blue #1 listed as an ingredient in some Nutrigrain bars. Michael Pariza, professor emeritus of food science and past director of Food Research Institute at the University of Wisconsin-Madison, said most food dyes are not dangerous, with the exception of Yellow #5, but they can influence our perception of food -- for better or worse. "Taste, appearance and smell all go together. You can have the most fantastic, nutritious thing in the world, but if it looks bad and smells bad, you're not going to eat it," he said. Blue #1 was at one point banned in several other European countries, but the EU later certified it as safe, said Lowe. Norway banned almost all food dyes from 1978 until 2001, but since then, they have had virtually the same regulations as the EU, he added. Lowe said synthesized compounds, when used in food, "are often things that are effective in small amounts, because they're so expensive," as is the case with artificial dyes. "People see the bright colors in cake icing and sugary cereals and figure that the stuff must be glopped on like paint, but paint doesn't have very much dye or pigment in it, either," Lowe writes in his blog. "Until the twentieth century, food coloring was obtained from natural sources," Jayson and Mira Calton write in "Rich Food, Poor Food." "People gathered spices, like saffron and turmeric, to add rich hues to their otherwise bland-colored foods. While this method may have been somewhat limiting in shades, at least it was safe. Today, most artificial colors are made from coal tar." Blue #2 is listed as an ingredient in Mars' M&Ms. In a statement from Mars, the company said, "Around the globe there can be slightly different formulations and products available based on both local requirements and consumer preferences. All the colors we use in our products, no matter where they are sold, comply with our own strict internal quality and safety requirements as well as all applicable laws, regulations and safety assessments relating to colors added to food. All colors are declared on the label in accordance with applicable national laws and regulations and always meet the highest safety standards." Lowe said the concern about blue food dye's connection to brain cancer is "unproven," referring to studies in the 1980s with Blue #2. Lowe said rats were fed the dye over a long period in much larger concentrations -- up to 2 percent of their total food intake -- than even the most dedicated junk-food eater could encounter. "Gliomas were seen in the male rats, but with no dose-response, and at levels consistent with historical controls in the particular rat strain. No one has ever been able to find any real-world connection," Lowe wrote. Yellow #5 is banned in Norway and Austria due to compounds benzidine and 4-aminobiphenyl, the Caltons say. "Six of the eleven studies on yellow #5 showed that it caused genotoxicity, a deterioration of the cell's genetic material with potential to mutate healthy DNA," the book, "Rich Foods, Poor Foods," states. Companies in the U.S. are required to list Yellow #5 in their ingredients because some people have sensitivity to it. "Companies are so sensitive about allergies, but peanut allergies would be far more common than Tartazine," Pariza said. Yellow #6 is banned in Norway and Finland, the Caltons say, but Lowe said the dye is approved across the EU. Lowe said benzidine and 4-minobiphenyl are two different names for the same compound, which is known as a human carcinogen. "But it's not a component of any food dye, certainly not of yellow #5, and it's not even any part of its chemical structure," Lowe said. A spokeswoman for Kraft provided a statement to ABC News, stating, "The safety and quality of our products is our highest priority. We carefully follow the laws and regulations in the countries where our products are sold. So in the U.S., we only use ingredients that are approved and deemed safe for food use by the Food and Drug Administration." The International Food Information Council has said food ingredients are "carefully regulated by the U.S. Food and Drug Administration (FDA) to ensure that foods containing them are safe to eat and are accurately labeled." "Red #40 may contain the carcinogenic contaminant p-Cresidine and is thought to cause tumors of the immune system," according to "Rich Food, Poor Food". "In the UK, it is not recommended for children," the Caltons write, but it is approved for use in the EU. The ingredient can be found in fruit cocktail, maraschino cherries, grenadine, cherry pie mix, ice cream, candy and other products, the Caltons say. Lowe said he can't find evidence for risk of tumors due to Red #40 and Cresidine "is certainly not a contaminant in the dyestuff" but is one pure compound. "There is a possibility for cresidinesulfonic acid to be produced as a metabolite, but that's a very different substance than Cresidine itself," Lowe said. Jones said high amounts of some ingredients could be damaging to some people, but that depends on the amount of consumption and the content of one's diet in general. "Unless you are crazy and you do drink 8 liters of pop a day, your diet is so disordered already, no wonder what you eat is toxic-- eating things in a way that never intended to be eaten," she said. Kraft said, "The safety and quality of our products is our highest priority" and the company "carefully follow the laws and regulations in the countries where our products are sold." Brominated vegetable oil, or BVO, acts as an emulsifier in soda and sports drinks, preventing the flavoring from separating and floating to the surface. The ingredient is banned more than 100 countries because it contains bromine, a chemical whose vapors can be corrosive or toxic, the Caltons say. Aurora Gonzalez, a spokeswoman for PepsiCo, which owns Mountain Dew, said, "We take consumer safety and product integrity seriously and we can assure you that Mountain Dew is safe. As standard practice, we constantly evaluate our formulas and ingredients to ensure they comply with all regulations and meet the high quality standards our consumers expect." Lowe said the same chemical dangers of consuming a bromine directly can be said of chlorine. Bromine-containing compounds can indeed cause bad reactions in people but not because bromine is a corrosive gas, he said. "When a bromine atom is bonded to a carbon, as it is in BVO, it's no longer bromine-the-pure-element, any more than the chlorine in table salt is the World War I poison gas, or the phosphorus in your DNA is the burning white phosphorus found in military tracer shells," Lowe said. This ingredient, which can bleach flour, is banned in Australia, the U.K. and many European countries, said the Caltons, who call it an "asthma-causing" allergen. Up to 45 parts per million is considered safe in the U.S. and it's found in a wide range of breads and baked goods here. While Lowe acknowledges the chemical can be used to "foam" foamed plastics, "the conditions inside hot plastic, you will be glad to hear, are quite different from those inside warm bread dough," he said. In that environment, azodicarbonamide doesn't react to make birurea - it turns into several gaseous products, which are what blow up the bubbles of the foam, which is not its purpose in bread dough. While repeated or prolonged contact to the chemical may cause asthma and skin sensitization, Lowe said that refers to the pure chemical and not 45 parts per million in uncooked flour. "If you're handling drums of the stuff at the plastics plant, you should be wearing protective gear. If you're eating a roll, no," Lowe writes. Potassium bromate, which strengthens dough, contains bromine, is also in brominated vegetable oil. "The good news is that American bread manufacturers tell us that it disappears from the product during baking and deem that potassium bromate is safe as there is only negligible residue," the Caltons write in their book. "However, the pastry chefs in Paris disagree. In fact, government regulatory bodies in Europe, Canada, China, and many other regions have banned the use of this additive. In California, if potassium bromate has been added, a product must carry a warning label." Lowe points out that bromate is different from bromide and bromine. "Chloride is the anion in table salt, but it's also the anion in hydrochloric acid. Hypochlorite anion is laundry bleach," said Lowe. "Perchlorate anion is in solid rocket fuel. They're all different; that's the point of chemistry." Olestra fat substitute is banned in the U.K. and Canada because it causes a depletion of fat-soluble vitamins and carotenoid, the Caltons say, "robbing us of vital micronutrients that our foods should be delivering." It is found in Ruffles Light and Lay's WOW chips. Frito-Lay did not return a request for comment about its use of Olestra. Lowe acknowledges that the non-caloric fat substitute interferes with the absorption of fat-soluble vitamins, "but potato chips are not a very good source of vitamins to start with," he writes. He also points out that Olestra is found only in two brands of potato chips, "since it was a major failure in the market." "And vitamin absorption can be messed with by all kinds of things, including other vitamins (folic acid supplements can interfere with B12 absorption, just to pick one). But I can agree with the plan of not eating the stuff: I think that if you're going to eat potato chips, eat a reasonable amount of the real ones," he writes in his blog. Banned in England, and other European countries, "these waxy solids act as preservatives to prevent food from becoming rancid and developing objectionable odors," the Caltons write. The state of California lists this ingredient as a possible carcinogen. General Mills did not respond to a request about its use of BHT in Chex cereals. Lowe said that BHT is approved by the EU and, "Animal studies notwithstanding, attempts to correlate human exposure to these compounds with any types of cancer have always come up negative." Recombinant bovine growth hormone and recombinant bovine somatotropin, a synthetic version of bovine growth hormone, can be found in nonorganic dairy products unless noted on the packaging. "However, several regions, including Australia, New Zealand, Canada, Japan, and the European Union, have banned rBGH and rBST because of their dangerous impacts on both human and bovine health," the Caltons say. American dairy producer, Stonyfield, opposes the use of rBST because of economics and cow health. "An increase in milk supply generally leads to a drop in the price paid to farmers," Stonyfield says on its website. "Price drops have put many farms out of business." In 1993, the FDA approved the use of rBST in dairy cows based on a review of existing scientific studies. Beth Meyer, a spokeswoman for the American Dairy Association and Dairy Council Inc (ADADC), a regional organization representing dairy farmers in New York, northern New Jersey and northeastern Pennsylvania, said over the last 20 years rBST has been heavily researched and separate reviews by the National Institutes of Health, the joint World Health Organization/Food And Agriculture Organization Committee, the American Medical Association, as well as regulatory agencies in Canada and the European Union have corroborated the FDA's conclusion. "RBST is one of many management tools used by U.S. dairy farmers to provide a safe, affordable food supply," she said. Canada and several European countries have affirmed that milk produced from rBST cows is safe for human consumption. These countries don't allow the sale of rBST to local farmers for reasons including economics, social customs and general opposition to technological advances used to promote efficient food production, not human health concerns. Bovine growth hormone (rBGH) is given to dairy cattle to increase milk production, Lowe said, and BGH levels in the milk of treated cows are not higher than in untreated ones. "Secondly, BGH is not active as a growth hormone in humans - it's selective for the cow receptor, not the human one," he said. Lowe points out BGH was banned in some countries due to animal welfare concerns. "As far as human health, there doesn't seem to be any evidence it's bad for humans," he said.